This was SJGR's first visit to this historic location in Haddon Twp, NJ, which currently houses the Camden County Cultural & Heritage Commission. During the course of the investigation, three investigators felt a male spirit in the basement. One Investigator felt that the spirit had a mischievous personality and one of the investigators felt as though he wanted to be left alone. Two of the investigators also sensed the presence of a woman on the main floor and a child on the second floor and attic. The physical evidence collected consisted of the exceptionally high amount of 19 EVPs and 16 positive photos with anomalies in them. Slightly less than 2% of positive photos obtained falls within the normal range for any locationlocation. 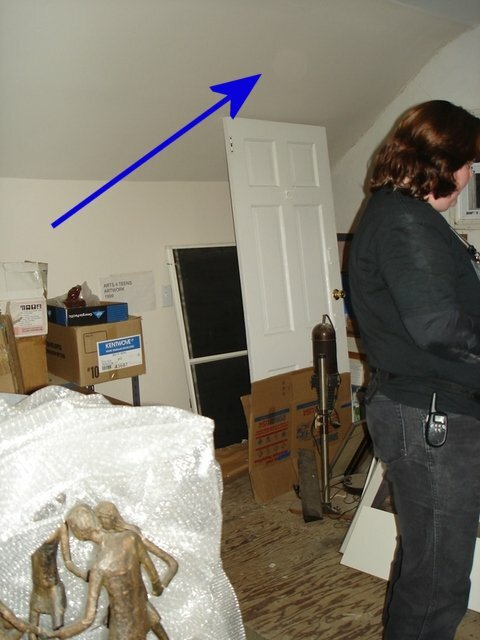 Anomalous EMF, temperature readings, and motion sensor readings were recorded during this investigation. There were also positive IR video was recorded. 8:55pm - Investigator Haines took this photo at random. 9:00pm - Investigator Cook took this photo at random.